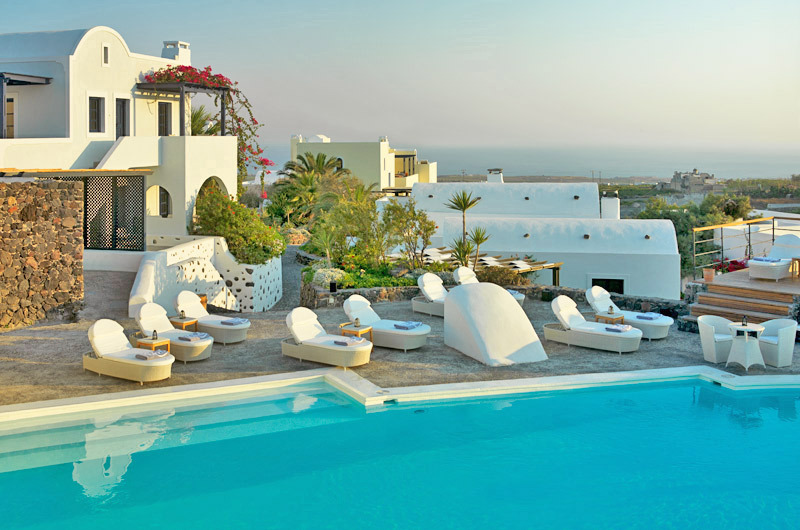 Vedema Resort is situated in the medieval village of Megalohori, 7 km away from Fira town, the capital of the island. It is a member of the Luxury Collection of Satrwood Hotels. Lush gardens contrast with the Cycladic architecture, providing 45 fully furnished villas with private verandas, lounge-dining rooms and every modern comfort, and 6 of them are luxurious suites with scrumptious view, four poster beds, external and internal Jacuzzi and 4 of them also include a pool. Its 15th century-styled winery restaurant, Vinsanto serves Mediterranean cuisine dishes whilst the Pergola pool restaurant offers light meals and Greek specialties. Wine tasting takes place every evening around sunset, at the Canava Wine Bar, while, later on, you may savour different types of caviars, French champagne and the best of Cuban cigars. Vedema has 45 spacious villas, in pastel-hued town houses domed with distinctive cupolas, have marble bathrooms, island-style furnishings, and terraces. All the houses have been renovated as of season 2004, from the famous Greek decorator, Aggelos Aggelopoulos. Dorian Apartment: Accommodation for 2 people in a suite with living room, bedroom and bathroom. Senior Dorian Apartment: Accommodation for 2 people in a suite with living room, bedroom and bathroom of first floor with sea view. Ionian Apartment: Accommodation for 3 people in a suite with living room, 2 bedrooms and a bathroom. Athenian Apartment: Accommodation for 4 people in a suite with living room, 2 bedrooms, 2 bathrooms. Corinthian Residence: Accommodation for 5-6 people in a suite with living room, 2 bedrooms, open-air mezzanine and 3 bathrooms. Aegean Residences & Olympian Villas: The suites consist of a sitting area, a separate bedroom and walk-in closet, and a bathroom. The suites interior design is island-style, tasteful and bright intended to reflect the natural beauty of the environment that surrounds the hotel. The suites are all different with local marble-stone bathrooms, Jacuzzi baths and separate showers. The bedrooms have Egyptian cotton linen sheets, antique furnishings, custom-made beds with hand-made wrought iron bed heads, satellite TV, DVD and CD player. Each of the 10 suites has its own private courtyard or terrace with teak furniture and swimming pool or private Jacuzzi. Presidential Villa: The Presidential Villa is a model of fresh minimalism originally inspired by the simple island lodges, and barefoot chic philosophy, found throughout Santorini. The Presidential Villa is able to accommodate up to 6 adults, offering 3 bedrooms with walk-in closets and 3 bathrooms, private swimming pool and big open-air Jacuzzi. The interior decoration features antique furnishings, custom-made beds with remote control adjustable beds, Molton Brown amenities, satellite Plasma TV, DVD and CD player The Presidential Villa, is the most luxurious type of accommodation that anyone can find in Santorini. Private dinning is offered within the mansion’s spacious living room, or at the terrace near the private whirlpool or overlooking the mansion’s exclusive swimming pool. The Artist’s touch is very much respecting the history of the house, and emphasizes on the stone floors and the hand-decorated ceilings (trademarks of the neoclassical style).